IRCTC registration is mandatory for booking tickets online. If you are new and want to book tickets from your home through the internet then you are at the right place. I will guide you step by step to create a new account online. And it will only take around five minutes to complete the registration process. Why we should go to a railway station and stand in a long queue for getting train tickets? 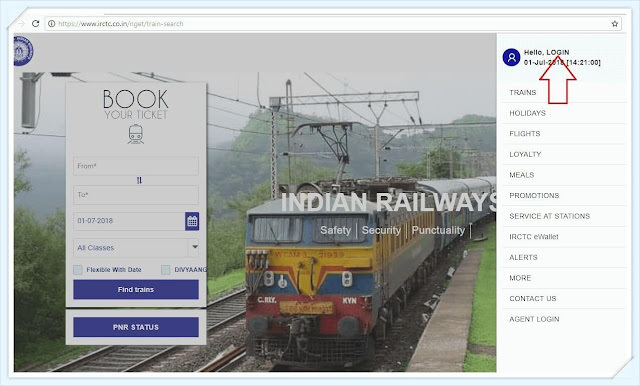 When Indian Railway Catering and Tourism Corporation Ltd. has provided an online service in the form of a website and mobile IRCTC app for IRCTC registration online booking. And why we should pay extra money for ticket booking to agents when we can do it our self with few clicks only. Indian Railways is continuously trying to improve its service to provide better facilities to passengers. It recently updated its website to speed up the ticket booking process. IRCTC new website can be used for ticket booking from computer and mobile and many other related tasks like train inquiry, seat availability check, to check PNR status, to check train status etc. The mobile IRCTC app can be downloaded from Google play store by searching "IRCTC connect"
But to use these services we must have an account to access online ticket booking services. It is very easy to IRCTC new account open and complete IRCTC individual registration. Submit the individual registration details in the form. Verify your email and Mobile. But sometimes you may get a problem in account registration then just follow the steps and process explained here to complete the account registration successfully. Click on the link to each step below, it will take you to the detailed process explained for that step, in many steps you will also discover many surprises and issues that you may face. Do you like the recently changed IRCTC new website? And would you like to have an IRCTC registration demo? You might have faced some kind of problem or have a unique experience while creating a new account. Enter https://www.irctc.co.in URL/link in the web browser address bar. It will redirect you to https://www.irctc.co.in/nget/train-search link. Look for the menu button in the top right corner as shown in the picture below and click on it to open the sidebar menu. When you click on the menu button a sidebar will open as shown in the picture below. Now click on the "LOGIN" word to open the login box. 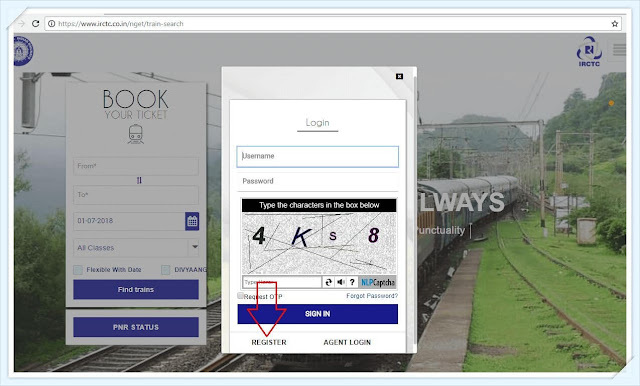 Now the IRCTC login page will open in the center of the website as shown in the picture below. It will have a "REGISTRATION" link at the bottom left corner of the login box. Once you click on the "REGISTRATION" link it will redirect you to the https://www.irctc.co.in/nget/user-registration link and an individual registration form will open on your screen as shown in the picture below. Open the web browser on your mobile phone. Enter https://www.irctc.co.in URL/link in the web browser address bar. It will redirect you to https://www.irctc.co.in/nget/train-search link. Look for the registration icon/button in the top right corner as shown in the picture below and click on it. It will open a new individual registration form directly after clicking on registration icon/button. 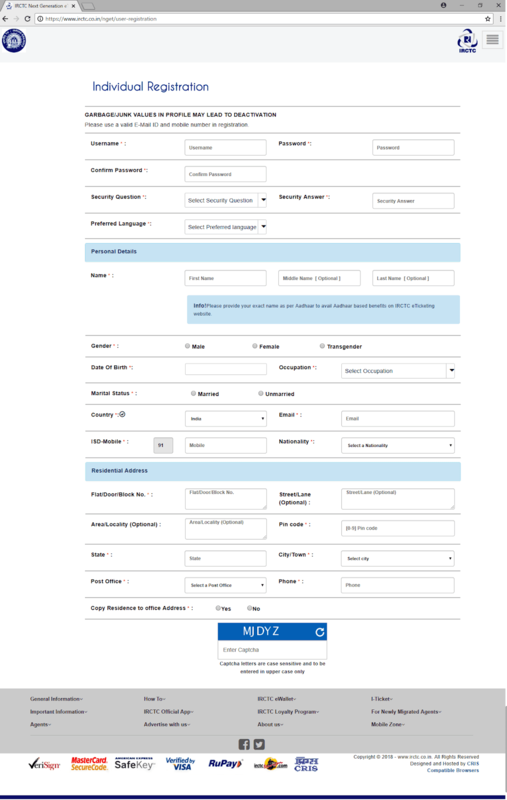 You can also follow the same steps explained for opening the form on a computer but in mobile a direct option is also provided and which makes it easy for users to access the form. Let's move to the next step of account registration. 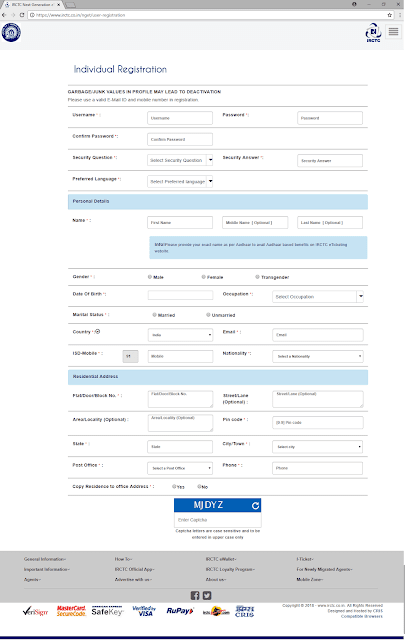 What do you think, is it difficult to access the registration form on the recently changed new IRCTC website? It is a very small step but very important to complete the account registration process successfully. If you avoid this then you may not be able to register an account or even may get your registered account deactivated after some time. We have categorized the general information displayed at the beginning of individual registration form as step number two. In this step, you have to read and understand the following two very important information messages given on the form. Please use a valid E-Mail ID and mobile number in registration. 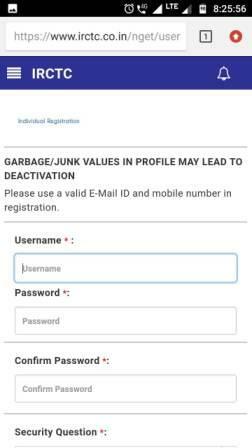 It is very important to fill the correct information in account registration form and maintain it in your profile account always, otherwise, IRCTC will deactivate your account when it detects junk and garbage values in your account profile. IRCTC do it many times to clear the garbage account profile from its system, to prevent unauthorized access to the online ticket booking system so that others can enjoy the service fully and securely. So, if you are new and just want to test the account registration form, even then don't enter junk values in the various options in the form. Many people do it to check the working of the form and later forgets to update the details. It is also very important to enter a valid email id and mobile number in the registration form. Because account activation link is sent to the email id you will provide and an OTP to verify the mobile number will be sent to the mobile number you will provide. If you provide false information or enter incorrect email id or mobile number then you will not be able to complete the registration as you will not get the activation link or the OTP. So, please enter your email id and mobile number carefully. Do you have any FAQ or suggestion regarding individual registration general information? Now in this step, you have to select an IRCTC Login ID/Username and Password. Login id and username are same things. Both these are mandatory to enter in the form. The username and password you select are very important, let's discuss why these are so important, one by one. It a red star marked option, therefore it is mandatory to enter this detail. Whenever you will access your account after registration, you have to provide username/login id. So select it carefully so that you can remember it always. Once you forget it, then it will be a bit difficult for you to get it back. And also you will not be able to reuse the email id and mobile number linked to your username. You can enter a username between 3 to 35 character. And only letter and number are allowed. If you enter an existing username registered by you or any other user then the system will alert you that the username is already registered and you have to select something else. And if your username is unique then the system will show a correct check in green color like the picture shown below. Now next step is to select a password. It is also a red star marked option, therefore it is also mandatory and you have to enter it. Although you can reset it later, still it is very important to remember the password you entered first time during account registration so that you can access your account first time. The password you enter must be minimum 8 characters in length and maximum 15 characters in length. And the password must contain at least one small and one capital alphabet and one numeric digit. Raj18 - it is less than 8 character in length. Rajeshkumar@2018 - it is more than 15 characters in length and contains a special character. rajeshkumarhindustani - it doesn't have a capital alphabet, a numeric digit and more than 15 characters in length. It is also a red star marked option, therefore it is also mandatory and you have to enter it. It is just to check and verify that you know and remember the password that you have entered in "Password" option. The value you have entered in the "Verify Password" option should match with the value entered in "Password" option. It generally happens that the username we select is already registered. Do you also face this problem that the login ID you thought of is already registered?